It has been sometime since I’ve read Pride and Prejudice and other than this one I’ve only seen the 2005 version…but I do think this one is the better adaptation. Since this is a miniseries…it has more time and able to add more scenes from more the book…That is of course one of the more plausible reason. But more than that…the screenplay, the costumes, the sets, the actors….they looked like they jumped out of the pages of the book. You know when I first watched this…I thought…wow all the actors look much older than their part…and the 2005 version does have a better looking cast don’t you think? But then again when you look at potraits of women of that time…doesn’t Jane (the 1995 version) look like one of them. Anyhow…its pretty clear…I prefer this version. It has better scenes. I really didn’t like some of the scenes in the 2005 version. For example that scene in the rain when Darcy first tells Lizzie that he loves her in the rain….chessy…was it not. 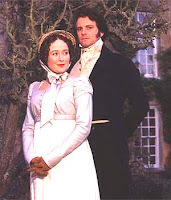 Then when he came at night to Mr Collins to drop off his letter while Lizzie was looking in the mirror….they must be trying to be artistic…And the ending…the worst scene of all…Lizzie at Darcy’s feet…taking off his shoes or messaging his feet or something…I can’t remember. Horrible scene. The 1995 version has a much much better ending, the couples getting married…simpler and better.